We tested our grass-fed beef burgers on an unsuspecting guest last night. David, a good friend from California, let us know that he was in town (and free for dinner! )–so I stopped by the store on the way home to pick up some condiments and some ale brewed in the Belgian, trappist monk tradition by New York’s own Omegang brewery and Aron set about to cooking the burgers. The burgers were definitely more juicy than those we usually make–most likely owing to their higher fat content, as we tend to opt for lean beef for everyday dinners. Aron’s skills no doubt helped, too; they were perfectly medium-rare. And the flavor was excellent, if not as pronounced as it’s been at some of our choice picks for best burger. I think it will take more to compete with the likes of Diner and Back Forty than some extra salt, but this fight aint over yet. P.S. 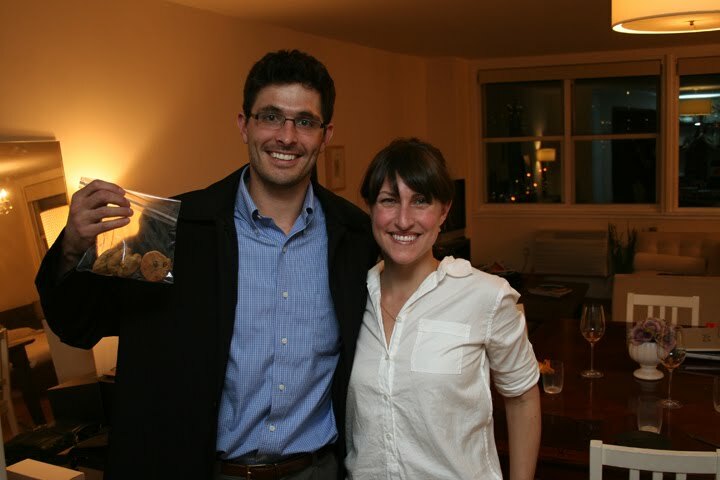 We sent him home with some of the cookies I baked–which he graciously accepted even after seeing me drop a full sheet of dough onto the floor. Man, what a klutz!